Day at the Races Video Slot Review - Casino Answers! Day at the Races is a 5-reel, 20-line video slot developed by WagerWorks, featuring a wild multiplier symbol, scatter wins, a free spins feature, a gamble feature and a bonus game. You can play the Day at the Races video slot at Bovada. The highest paying symbol on the Day at the Races slot game is the Male Spectator symbol. By landing 5 Male Spectator symbols, you can win up to 200X your bet per line. However, you can get a wild multiplier and double your win up to 400X. The Horseshoe symbol is a wild multiplier. 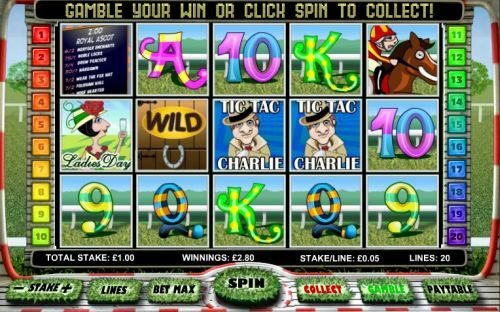 Not only does it substitute for all other symbols on the Day at the Races slot machine, but it will also double your win for all but scatter and feature wins. The Sleeping Horse symbol is the scatter symbol on the Day at the Races video slot. By hitting 3, 4 or 5 Scattered Sleeping Horse symbols, you will win 2X your total bet plus 15 free spins, 5X plus 20 free spins or 10X your total bet and 25 free spins. After any win on the Day at the Races video slot, you can press the “Gamble” button to open up the gamble feature. To ignore the gamble feature, use the “Collect” button. You can predict the colour of the card to double your win or suit of the card to quadruple your win. Press the “Collect” button to collect your winnings and exit the Day at the Races gamble feature. You can really add onto your winnings with the gamble feature on Day at the Races at Bovada. Payouts are displayed on the Paytable. All wins pay left to right only, except for scatter wins. Only the highest win is paid per selected payline. Malfunction voids all plays. The Day at the Races casino game has a simplistic autoplay mode. The autoplay feature can be accessed by pressing the “Auto” button. Rather than picking a specific number of autoplay spins, the autoplay mode on the Day at the Races slot game will play continuously until you get a win. The autoplay mode will stop on any win you receive. You can stop the autoplay mode at any time by using the “Stop” button that has replaced the “Spin” button. Day at the Races is a decent video slot from WagerWorks. It’s nothing too impressive, but it does offer many different special features to enjoy. The theme is near and dear to many punters’ hearts and it’s one they will appreciate. You can play the Day at the Races video slot when you sign up and make a deposit today at Bovada! Can American players play the Day at the Races slot machine for real money? No, American players or USA-based players cannot play Day at the Races for real money. However, American players are welcome to play the Derby Dollars Video Slot at Bovada. Is there a free flash game of the Day at the Races video slot that I can play? 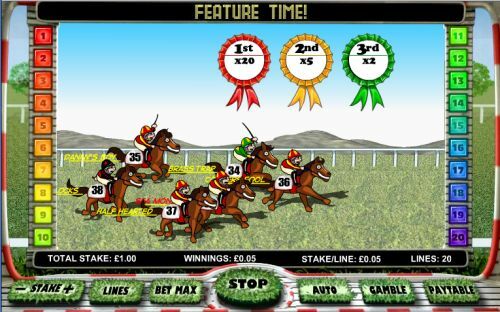 Yes, Day at the Races is played from your web browser without any casino software required (or available) to download. You can play Day at the Races for free or real money. If you have any issues with the flash casino, we suggest that you download the newest version of Adobe Flash Player.